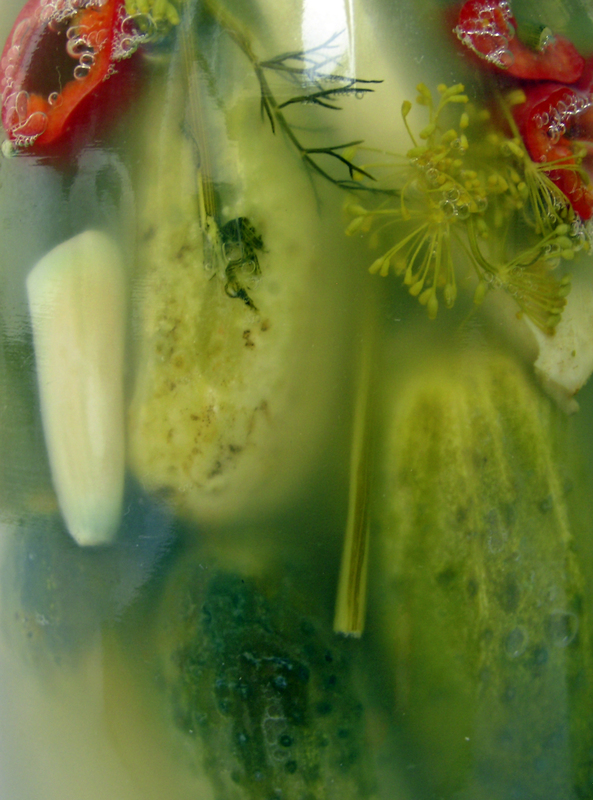 If you like Kosher dill pickles, you will love these simple-to-make refrigerator pickles. I sliced some cucumbers and cut spears with some and combined both in the same jar. They are really, really delicious. Bring ingredients for the pickling solution to a boil. Wash about 4-5 lbs. freshly picked cucumbers. Layer whole, unpeeled cucumbers, onion, cloves and garlic and dill. Pour vinegar solution over the top, let set on counter for 3 or 4 hours.Refrigerate, ready to eat in 2 to 4 days. Variation: Sliced cucumbers may be used, and ingredient amounts can be varied to your taste.